NEW YORK -- Slugging outfielder Yoenis Cespedes is returning to the New York Mets. How long he stays, he'll decide. A person familiar with the deal says the star free agent and the National League champions agreed Friday night to a three-year contract for $75 million. The 30-year-old Cespedes can opt out of the contract after just one season and make it worth $27.5 million. Cespedes also got a full no-trade clause. The person spoke to The Associated Press on condition of anonymity because the deal was still pending a physical. Other media outlets reported the terms earlier. Cespedes was traded from Detroit to New York last July 31 and became an instant hit in his new home. He launched 17 home runs in 57 games, powering the Mets to their first World Series appearance since 2000. Kansas City won in five games. The Washington Nationals were also said to be interested in Cespedes, especially after they finished a disappointing second to the Mets in the NL East. The Nats previously signed free agent second baseman Daniel Murphy, who starred for the Mets in last year's playoffs. 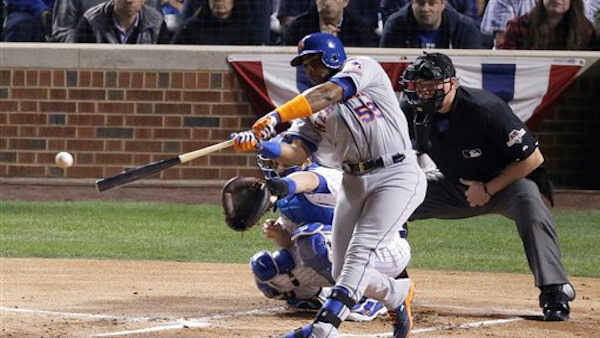 Cespedes gives the Mets the power bat they needed in the middle of their lineup. With a rotation full of young aces, the Mets felt it was a must to get somebody to drive in runs. Cespedes had 44 RBIs for the Mets in his limited stint with them. He combined for 35 home runs and 105 RBIs while batting .291 for the Tigers and Mets. He twice has won the All-Star Home Run Derby, including the 2013 crown at Citi Field. Along with his hitting, he won an AL Gold Glove for his four months in the Detroit outfield last year. He split time in center field and left field for the Mets. Cespedes has hit 106 homers in four seasons with Oakland, Boston, Detroit and the Mets and was an All-Star in 2014. The flashy Cuban seemed to fit in neatly inside the Mets clubhouse and had indicated he felt comfortable in New York. If Cespedes left after one year, the $27.5 million would tie Alex Rodriguez for the second-richest average annual value of a contract by a position player. Miguel Cabrera's deal averages $29.2 million per year with Detroit. As of now, the free agent class for outfielders next fall is far weaker than the deep field this year, with a steep drop-off after Jose Bautista.